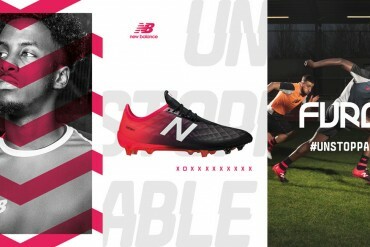 Umbro have today unveiled the brand new England Home shirt to be worn by England as they attempt to qualify for the European Championships in 2012. 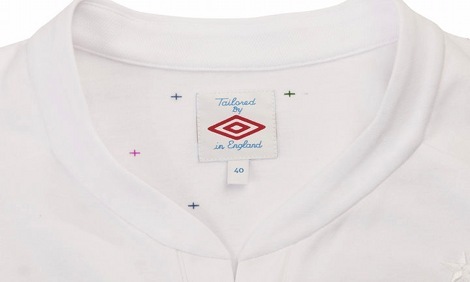 The new England shirt picks up where last year’s design left off, continuing the Tailored by Umbro tagline. The main change, though is all about one thing – colours! For starters, manufacturers Umbro have changed their logo to a royal Blue colour to match the famous Three Lions on the badge. Umbro have also gone with a return to Blue Shorts – a big step away from the all white look of last year’s kit. 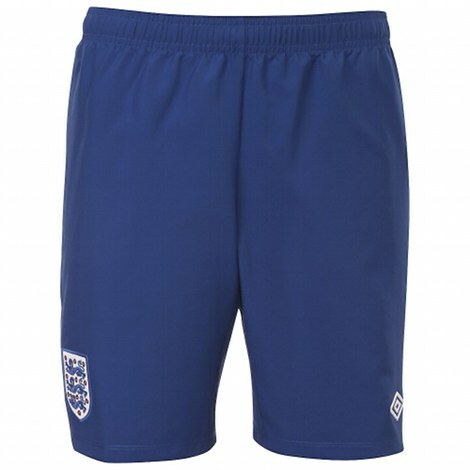 The Royal Blue shorts are a much brighter shade than the Navy Blue that has been so popular as part of England kit in the past, so though present a very interesting look on the pitch. 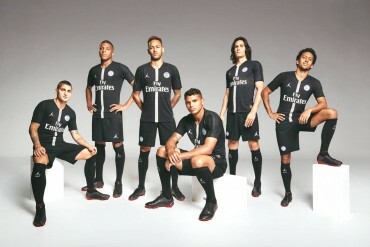 Finally, the most colourful aspect of this new kit is the…shoulders? That’s right! 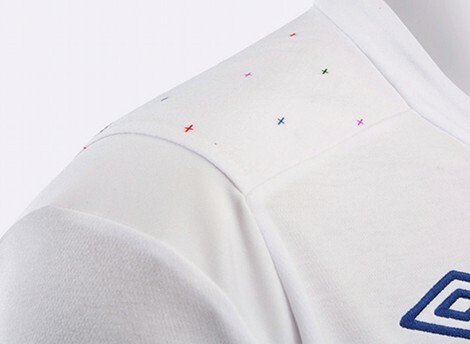 The shoulder panels of this new England Shirt feature dozens of tiny St Georges’ Crosses in a multitude of different colours. The man behind the design – legendary pop-artist Peter Saville – explains that this design is to encapsulate the diversity of modern England. With players from a multitude of different heritages pulling on the new England Shirt, Saville says this is a chance to represent the modern England and celebrate it’s variety of cultures, an dispel the myth that England is a nation comprised of people ‘sitting in pubs, drinking ale and eating roast beef’. It’s definitely a bold move by Saville, and we’ll reserve judgement for now – we’re still getting used to the idea that the new England Shirt has purple and green on it! 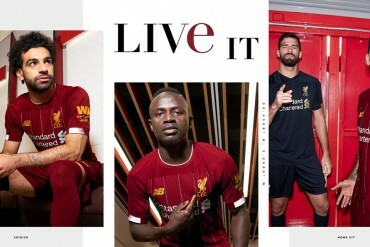 The goalkeepers kit is now completely black, aside from a daring purple trim around the shoulders and chest of the shirt. Another change from last year is a tapered collar, designed to mimic a traditional dress shirt, further emphasising the formal and tailored feel of this year’s kits. The full range of England gear, including the new England Shirt is available to buy from October the 12th 2010, and the new kit will get it’s debut against Bulgaria on Friday the 3rd of September! Have your say on the New England Shirt with a comment below! 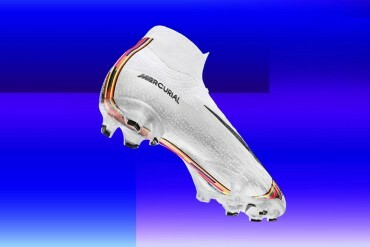 Previous articleIS THIS THE FUTURE OF FOOTBALL BOOTS? It’s nearly the same as the old one and its a bit plain. I think the shirt looks wicked and everyone should buy it. I don’t think that picture’s the new shirt… If it is Umbro have really dropped the ball on this one! 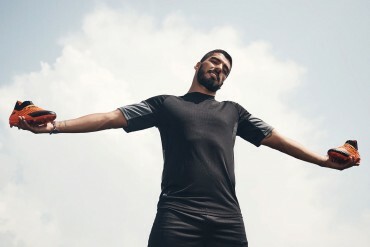 Nike own umbro, not sure if they have anything to do with product design tho..
Is it crusade war shirt? I hope it’s fake shirt. Sh*t shirt, sh*t team. ’nuff said. thats relli tatty, looks like something you would get at matalan for a fiver! Yeah it looks…Unbalanced…there’s no Blue and it looks almost too simple. Honestly, why would a national football team put blue in their shirt when their nations flag is red and white. It is an England shirt not a British shirt! You a labour supporter, you been brainwashed mate! Apparently it has been identified as a fake, what a relief for all English fans! It’s a knock off from Thailand according to FootballShirt Culture – been out for a while (October at least) and definitely not the new shirt… I think the new one is out in a couple of months. What you on about the traditional blue ? Blue is Scotland colours the first time we`ve come away from blue and I applaud that as a fervant England fan that`s not bought a shirt in years because of the blue. We won the World Cup in red and white it`s the saddo FA that include blue. Even Wembley the home of England have stuffed toys wearing blue and white, thick as…. this shirt just looks soo bad, honestly looks like a child has designed it with felt-tip pens. this will be one of, or if not the worst england kit that i can remember. 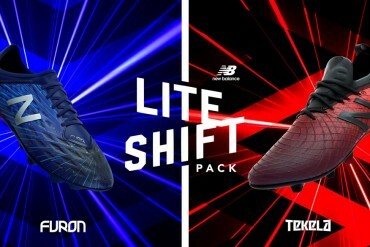 with nike interested why not let the, in my opinion better company design us something nice. we may still play sh*t but atleast we will look good..
surely this is a wind up,its the worst shirt ever!! !and for 50 quid,no thanks.i reckon a shirt similar to the 60s one be brilliant,more tighter fit similar to what the italians have. this is a really nice shirt, it is not however a football shirt…… its a blatant attempt to get the shirt recognised as acceptable casual wear. 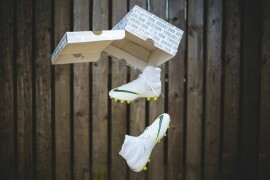 no way should it go to nike, not as long as there is an english company to make it!!! oh and i totally agree with the comment that about the blue. its the england team not team g.b. this is really good. i’m not an england fan at all, but i’m glad they went back to a classic, because every modern england shirt i’ve seen is terrible. this is good. i love classic and retro shirts but Ăâ€šĂ‚ÂŁ50 for a white polo shirt. Come’on get real UMBRO! I hope they give free shirt printing cos thats the only way it looks good with the red numbers and names. No way this shirt is class.. The way they used the classic plain look, brilliant. Why add all these stripes and useless symbols. For me two thumbs up, standing obation, raise of the arm and a salute all due to umbro. Bravo!!! I think it looks really smart. Going back to the old school was a great call, retro is all the rage right now. Instead of calling it plain, a better word to describe it would be subtle. Doesn’t look too loud or cluttered. Sounds like it has some uses some innovative technology for heat regulation and the like too. Generally, for fashion’s sake, I wouldn’t go out in a football shirt unless playing football or going to a match, but I can definitely see myself wearing this out and about, which makes this *possibly* worth the Ăâ€šĂ‚ÂŁ50. hahahahaha, england played v slovakia with that shirt :). It just look like a plain polo shirt..
Umbro have just shown that they will be the next british industry to go bust after england failing to get to euro 2008 they must have lost a fortune and now this half arsed attemt at a football shirt, easy to copy and dull, easier to bu the kids a Ăâ€šĂ‚ÂŁ7.99 polo with the three lions on fron JJB luckily the world cup will be played while we all sleep so we wont have to look at this awful shirt. Ăâ€šĂ‚ÂŁ50 for a polo shirt! mad!!!! ..simply the worst..will not buy it even at 9,99..it’s sissy, not for football, it’ for riding a horse! Fire the entire staff of designers! Now can’t make cars anymore, and cant make jerseys either..let’ s stop to make tea and call us yankees! I’m surprised people don’t like this. I think it looks smart and it’s bringing some class into the game. 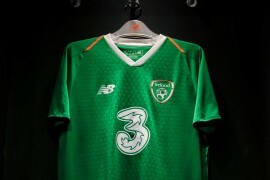 The jersey is awesome…I’d actually get it but for 50 quid it has me thinkin! It just doesn’t have the same class as the current kit. I think I’ll be holding on to the current one for the next couple of years. 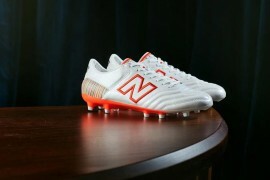 I feel like I am being stiffed by England and Umbro. Whoever it is that decides to bring another shirt out now? I like the shirt design, it looks OK. But I’ve just bought the home and away shirt for the WC and now another shirt release makes mine dated. I hope this shirt bombs and Umbro start thinking about the fans for a change. They shouldn’t be able to control the shirt of England. 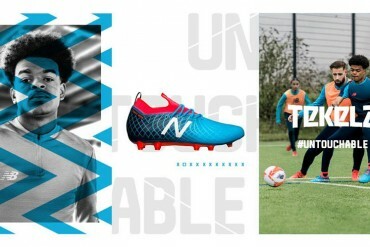 first, i doubt that this is fake design/training piece/whatsoever, since i’ve also see this on umbro’s official blog & official facebook page. 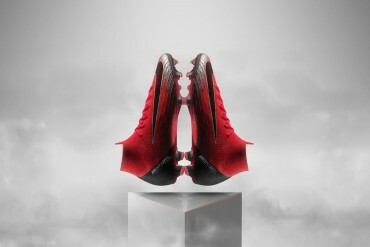 so this could be it… the lads are (sadly) going to hit the pitch in these. second, with all do respect, i truly hate the design. those neckline going down the chest made the shirt looked like my auntie’s pajamas. and the colorful little cross on the shoulder are just meaningless. it doesn’t do anything. nobody would even see that. i thought huge dragon on inter milan’s shirt was bad idea, but at least people could see that, maybe terrorize the opponent a little -or make them laugh, but at least it’ll do something. 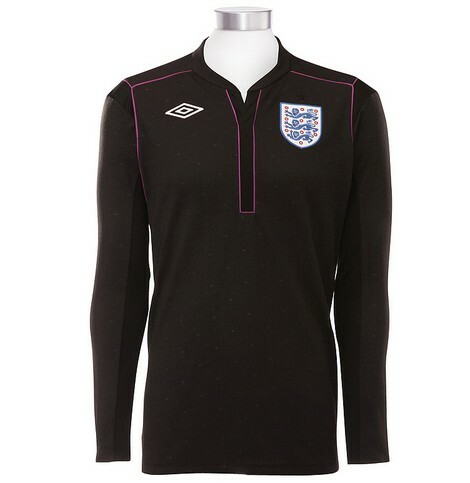 third, why i love last England’s shirt and not this one? the last year shirt was boldly all white, crazyly old school, and ground-breakingly nobody would think of that. no shirt in the world cup looked like England’s. while this one? this one is just another last year’s wannabe. it’s not one of a kind anymore. whatever it do, it only trying to imitate last year’s design, it won’t surpass them. last but not least, i’d never really get why companies just HAD TO release a new damned jersey for every new damned season and tournaments?? madrid and chelsea had their best jersey design last season IMHO. but this season they’re back to old three stripes templates (and they’re calling it “classic”. what a ripoff…). pick one that fans love the most, and when new season comes, just change the year and the sponsors. stick with it at least for the next 2 seasons. i guess this is one for “from the sole”: FOOTBALL SHIRTS: IS IT TIME WE LEFT THEM ALONE? @channo – why dont you send in a from the sole? the f.a has 1ce again found another way to rip off the english public. 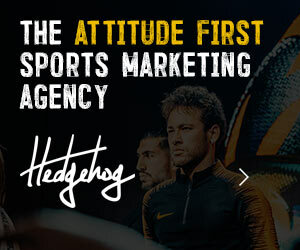 definitely not fake… go on official england homepage … the advertisement is the same pattern as kit !… i swear its usually march the kit changes ?? what is going on?!?! wow. these are are really plain and boring. it looks like a normal tshirt not a soccer jersey! seriously. Much better than the last one. International kits should be plain. This is like the old classics. 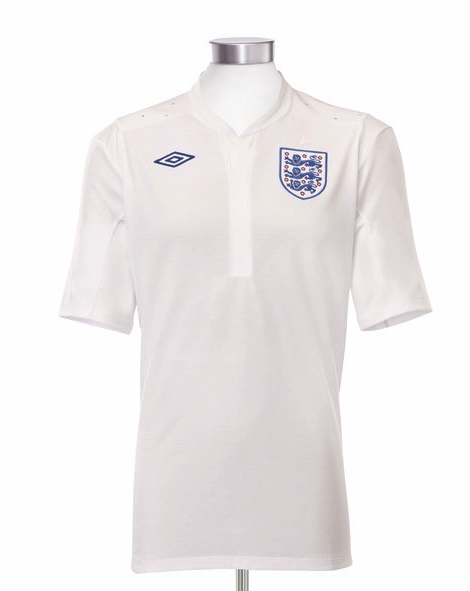 this england kit is like a pair of Copa’s, its not the flashiest or hig tech bit of kit around, but its gets the job done. England kits are about the subtle differences, and glimpses of unseen quality and about tradition. For you who call it boring and plain…your just not even worth the effort. werent sure at first then i stared to like it but those multicoloured croses on the shirts RIDICULOUS (or how ever you spell it) inside the shirts cool but its put me off on the on the shoulders. Don’t get me wrong I’m all for the retro, simple kits with subtle detailing BUT I just don’t think Umbro managed to pull it offf with this kit :/ Even if they just made that bit which goes around the collar and down the front blue or maybe added some trim to the sleeves then I think it would make the shirt look MUCH better but that’s just me. 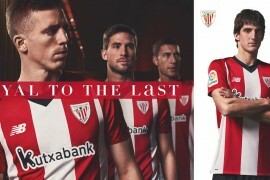 The last strip was much plainer (and better) than this and was advertised as 2009/2011 so it’s just another money grabbing exercise. And can somebody tell me what is wring with sitting in a pub drinking ale and eating roast beef. !!! 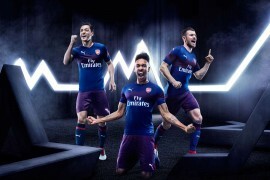 Pingback: UNDER ARMOUR ENGLAND KIT? Pingback: HAVE YOU GOT WHAT IT TAKES TO SCORE AT WEMBLEY?